Doddington church, with its unusual dedication to the Beheading of St John the Baptist, stands on a hill north east of the village, adjacent to the park surrounding Doddington Place. The church is set in its ancient graveyard, which is a managed conservation area. Illustrations of some of the flora and fauna to be found here are displayed on panels in the South Chapel. 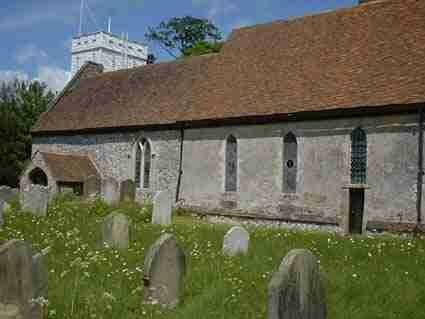 There is evidence that a church has existed on this site since Saxon times and it is mentioned in the Domesday Book. The present building probably dates back to the 12th century and has several important features including two full-length, 13th century wall paintings outlined in red ochre, and a 'double-squint' which enables the congregation in all parts of the church to see the priest. The South Chapel is in the Early English style, dating from the 13th century. Of similar age is the stained-glass medallion depicting the flight of the Holy Family into Egypt, which can be seen in one of the east windows. The weather-boarded, square tower was erected in the early 19th century, replacing the previous tower which was destroyed by fire in 1643. An excellent illustrated guide to the Church by Dr Jones-Baker, entitled A History of The Parish Church of The Beheading Of St John The Baptist Doddington, Kent, can be purchased from the Church, The Chequers, Doughty's butcher and Doddington Service Station. It gives a comprehensive overview of the architectural features and history of the building and is an invaluable companion to a visit. The Old Vicarage was until recently a residential home, but has been converted back to a private residence and is used for Bed & Breakfast accommodation. Sections of it date back to 1656, when it was known as Church Hill House; the most recent additions are Victorian. This was founded under the will of a former vicar of the village, the Reverend Daniel Somerscales, who died in 1737. It was originally housed at Doddington Vicarage but was relocated to the Fleur de Lis Heritage Centre in Faversham in 1982. It constitutes one of the few ancient libraries of its kind to have survived. Consisting of around 400 volumes, the works are mainly theological, but include 17th and 18th century editions of medical, natural history and geographical texts. The original catalogue of the library (dated 1743) is still in existence. There are no incunabula: the earliest work in the library was printed in 1501, just 27 years after Caxton introduced the art of printing to England. One of the original wooden travelling cases (now converted to a cupboard) still houses some of the books. The library is open to any parishioner of Doddington by prior appointment with the Heritage Centre and is certainly worth a visit.